A necktie is essential component of a suit. It defines the neck while adding new colors and patterns to your outfit in the process. If you’re going to wear a necktie, though, you’ll need to follow some basic steps to secure it in place. Failure to do so will result in your necktie shifting or slipping out of place, thereby creating a messy appearance. You can prevent this from happening to your necktie by doing the following. Leaving the knot at the top of your necktie loose increases the chances of it shifting and slipping out of place. Some men use a loose knot because it’s more comfortable and less constricting on their neck. But the problem with loose neckties is that they are more likely to shift. You don’t have to use an ultra-tight knot, but make your necktie tight enough so that it doesn’t shift while you are wearing it. If you can move the knot around your neck by gently pushing it, it’s too loose and needs to be tightened. There are dozens of ways to tie a necktie, each of which uses a different approach. To create a strong and secure hold around your neck, though, you should stick with one of the four major necktie knots. This includes the Four in Hand, Windsor, Half Windsor and bow tie knot. When compared to other knots, these knots are less likely to slip or come undone. If you’re unfamiliar with them, you can watch step-by-step video tutorials on YouTube. Just search for the type of knot that you want to tie. This is arguably the easiest way to learn how to tie a new knot, as it shows rather than tells you how to do it. Also known as a tie clip, a tie is the perfect accessory if you’re struggling to keep your necktie from shifting. Featuring a small, horizontal piece of metal in a clip-like design, it will secured your shirt to your necktie. You clip part of the tie bar into the front opening of your dress shirt and then place your necktie over it. With a tie bar, you don’t have to worry about your necktie flying around when you bend over or move. It will remain secured against your chest for as long as the tie bar is clipped in place. You can find tie bars available in countless colors, styles and sizes, so feel free to choose the one that’s best suited for your outfit. Chrome tie bars have become popular in recent years, but you can also find them available in black, white, pearl and other styles. An alternative to the tie bar is a product known as the Tiedown. Available on Amazon, it features a similar design as a tie bar. It’s small and rectangular, and it’s also worn on the shirt around the same area. The Tiedown features a small flap at the top through which you can place your necktie. So, like a tiebar, the Tiedown secured your necktie to your dress shirt — just in a slightly different manner. Regardless, it’s a simple and effective way to prevent your necktie from shifting. Of course, a paperclip can be used in a similar manner as the Tiedown. 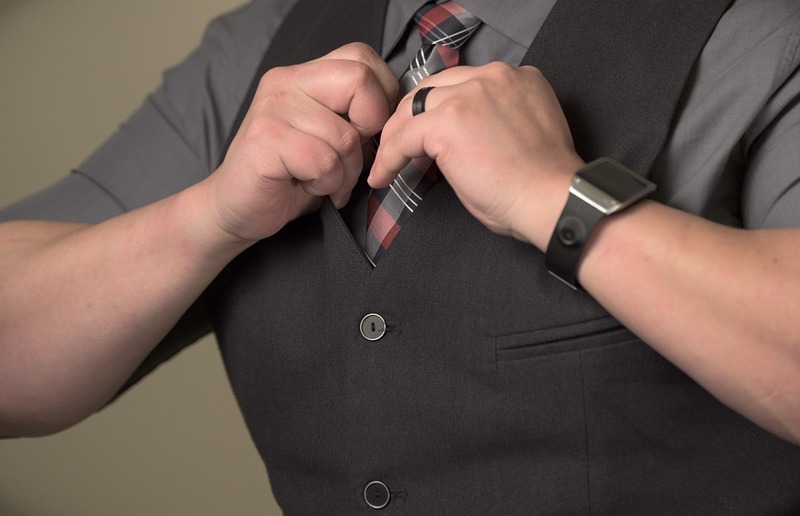 Life Hacker reveals that you can place a paper clip through one of the buttons on the front of your shirt and connect it to the piece of fabric on the underside of your necktie. The paperclip will secure your necktie in place, preventing it from shifting or moving around. The downside is that paperclips can be pretty sharp, so the tip may damage your shirt or necktie. If you’re going to use a paperclip to secure your necktie in place, file down the tips to protect your tie and shirt from damage. You should also twist the paperclip in place to create a stronger hold. And also, make sure that the paperclip isn’t visible from the front. No one should be able to know that you are wearing a paperclip in your shirt just by looking at you. 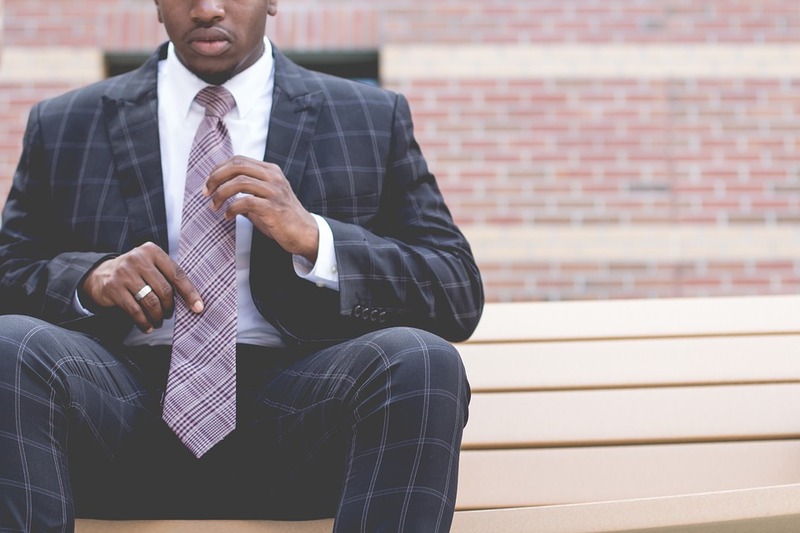 This won’t necessarily prevent your necktie from shifting, but it’s still a good idea to retighten your necktie throughout the day if you have trouble keeping it in place. If you’re at work or attending a formal event, take a break to go to the men’s restroom, where you can then retighten your necktie. Alternatively, if you’re driving in your car, you can pull over at a gas station or rest area to retighten it. It’s important that you choose the right type of necktie. There are hundreds if not thousands of different neckties available, ranging in size, shape, material, cut, pattern, color and more. Normally, neckties made of a thicker cotton or cotton-polyester blend offer a more secure fit than neckties made of linen or silk. You can still wear neckties made of these fabrics, but you may have trouble keeping them in place. A necktie made of cotton or cotton-polyester blend, on the other hand, is less likely to shift when you are wearing it. How will a dryer sheet prevent your necktie from shifting? It’s not a foolproof method, but it may work is static cling is causing your necktie to shift. Dryer sheets don’t just make your clothes smell nice; they also reduce static cling. You can rub a dryer sheet across any garment or accessory, including a necktie, to instantly neutralize any static electricity. It’s frustrating when your necktie continues to shift or slip off throughout the day. Not only is does look funny, but it’s also uncomfortable. The good news is that you can prevent your necktie from changing position by using the tips listed here.